JumpLists is a new feature in Windows 7 that applies to all Taskbar application icons that allows easy access to common tasks related to the corresponding application. When user right click on an icon of an application sitting on the Windows 7 Task Bar, a “Jump Lists” contextual menu will display all the last instances of the application in the Taskbar, together some other frequently used functions. For example, when user right clicks on Internet Explorer 8 (IE8) program on Taskbar, a list of last visited websites or URLs history is displayed. In Microsoft Office programs such as Word or Excel, last opened, access and used documents or files are listed. Windows Explorer’s Jump Lists will show shortcuts to frequently used folders such as Documents, Music, Pictures and Videos (which can be added or removed). Other examples include Microsoft Paint JumpLists show list of recently opened images, Windows Media Player 12 (WMP) Jump Lists show most recently played songs and music tracks, with direct access to common tasks such as “Play all music shuffled”. 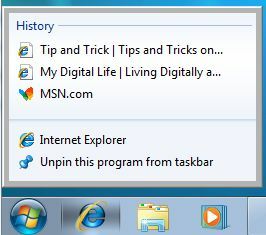 Common to all application programs pinned or running in Superbar (Windows 7 Taskbar) is ability to pin or unpin a program to or from Task Bar, close window, and command to launch and run another instance of the program. Jump Lists makes navigation of program and access to features of the program easier. Gone is the classic usual “Restore”, “Move”, “Size”, “Maximize”, “Minimize” and “Close” commands which fill the right click context menu when user right clicks on a button in Taskbar in previous version of Windows. To display these old classic menu again, user have to press Shift-Right Click.